Trinidad monastery converted into museum. Cross removed also from functioning church. We have all seen the photos of the pre-revolution American automobiles. But riding through Cienfuegos, my first stop, it is so obvious that this country froze in a time warp in the late fifties. The economic growth of the rest of the world and in particular of their close neighbors, the USA, passed them by. It is in particular evident in residential and commercial construction, and in the transportation system. Unpaved streets, grey water running out into the streets, bicycle taxis and horse drawn carts remind me of southern Spain in the mid-fifties. Just like what I observed in the former Soviet Union countries along the Danube the residential and commercial structures are in a sad shape, through a lack of maintenance and incentive when the state were the owners. But as far as fashion, music and smart phones, most of the Cubans behave just like their neighbors, where income permits. 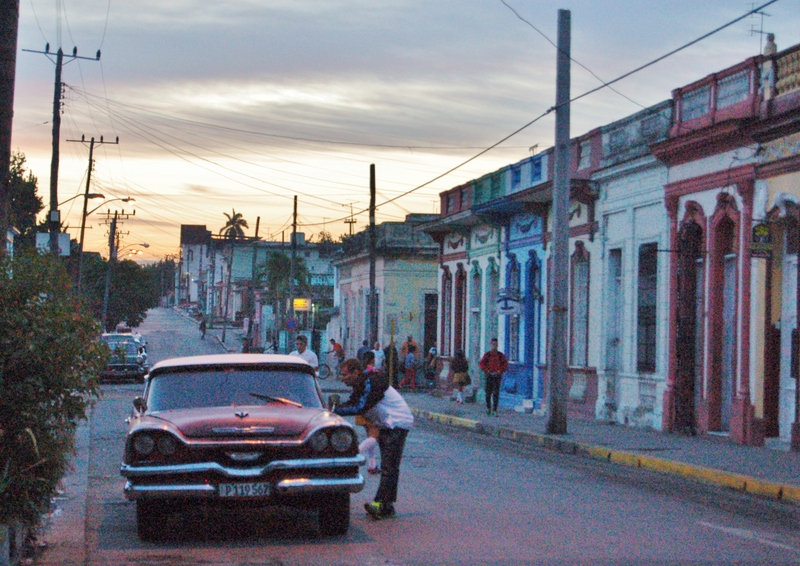 Beggars are rare but poverty is obvious, very few Cubans can afford an automobile. The lack of newer cars has little to do with the US embargo. The Russians sold a few vehicles. No traffic jams here. 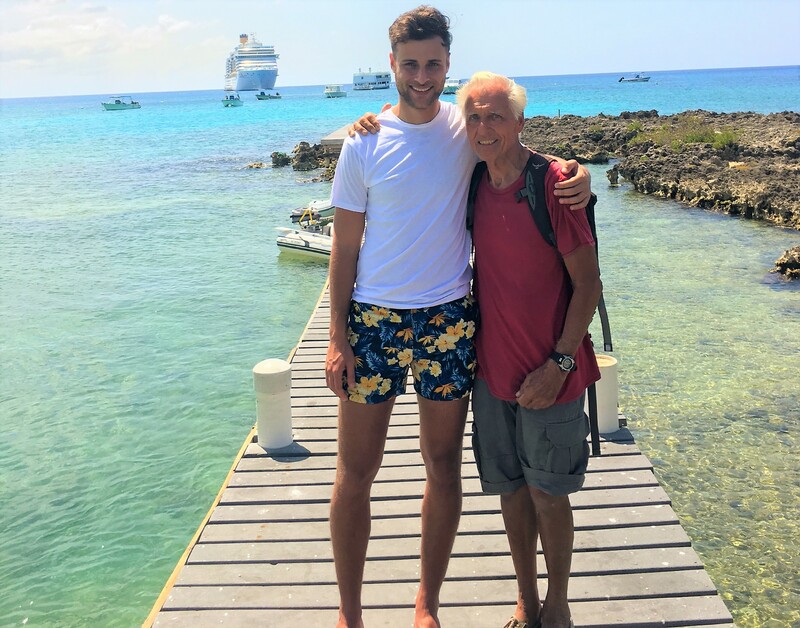 Whereas in my previous stop, in the Grand Caymans, I could walk faster than the automobiles working their way home at day’s end. I had a Cuba Libre an hour ago before dinner at a beach side restaurant. But the Cubans are not Libre. I commented on this and asked the server if the fish came from Mexico, because I have not seen a single fishing boat yet. We, cruising boats, are not allowed to go ashore to places where there is no official marina, only on uninhabited islands, for fear that we are going to pick up a few Cuban stowaways. The majority of cruisers and tourists I ran into in town are German, followed by the French and other Europeans and Canadians, a sprinkling of Americans. Technically the US Government does not permit their citizens to visit Cuba but for a few specified reasons. It is not too hard to circumvent this by flying here and returning to the USA from another country, like Mexico or Canada. The Cubans will oblige by not stamping your American passport. I am here legally (as of today) because I qualified for one of the few qualifications, but had to obtain a Coast Guard permit that is only good for 12 days. I will come back and then probably do it the easier way. Cuba has always drawn me but in familiarizing with the lay of the land I have come to the conclusion that Cuba has so much more to offer than the Bahamas and the Virgin Islands, popular for their close vicinity to the USA vacation for short time cruisers. In particular, the well protected Cuban south coast, with so many bays and anchorages, sounds and uninhabited cays and the proximity of typical Cuban towns like Cienfuegos, Trinidad, Santiago, etc. It is still very inexpensive. The clearing in into Cienfuegos was painless and costless, health, harbor master, immigration and customs all came to the boat within the first two hours. Today I filled my water tank and topped off my diesel, all of 27,3 liters, since Montego Bay 350/400 miles back. When I mentioned that I tanked 18 liters (4 1/2 gallons) in Montego Bay for the transit of the Panama Canal and the 650 miles of ocean, the attendant said: “Only Cristopher Columbus used less diesel to get here…” Most of the 27,3 liters were due to the very strong northerly I ran into 20 miles before the entrance to Cienfuegos. It had been a fairly close hauled North Easterly from Grand Cayman, but, for once, the weather forecast turned out to be right. 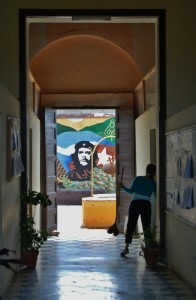 In the early afternoon near Cuba the wind started easing from the NE and ended up in the NW, I had to jibe in the end. Then it just stopped all together. I cranked the engine up, set the auto pilot and took a nap. When I woke up and looked at the digital chart I was being pushed sideways towards Puerto Rico. 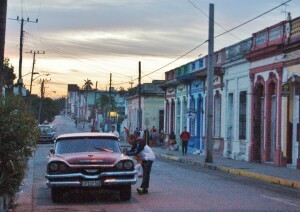 I had set the engine at a low speed to try and delay my entry at Cienfuegos for daylight. I revved the engine up but still was only making a knot over the ground. What to do? 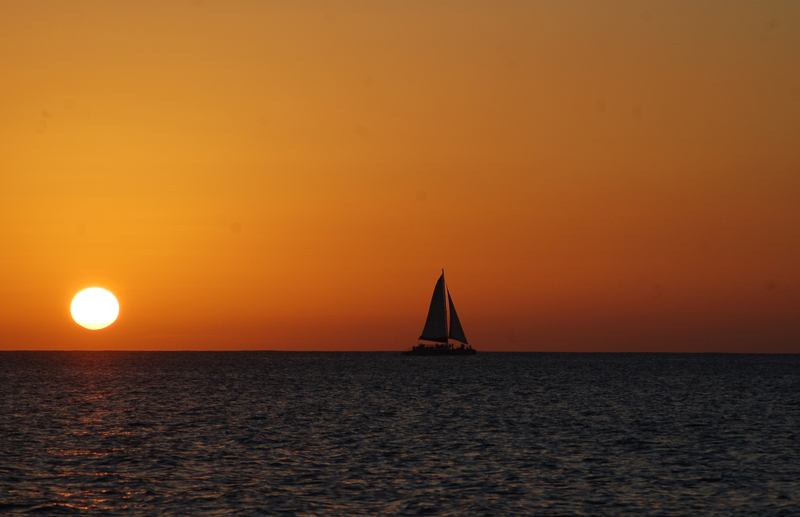 Raise the sails and tack up wind, these last twenty odd miles? I decided to delay the decision. At time waves knocked me back to less than a knot but slowly I was making some headway, the closer I got to the upwind shore the speed crept up. I still ended up doing the long winding entry from the Caribbean Sea to the marina in the dark. It was a beautiful sunrise over the Sierra Madre Mountains, from where the Castro brothers fought the war to convert Cuba into a Communist state. Internet connections are almost non-existent. First you have to buy a scratch card for 1 CUC (about $1.15) which is good for an hour on the internet, but I spend about half of that re-connecting when the signal goes south. 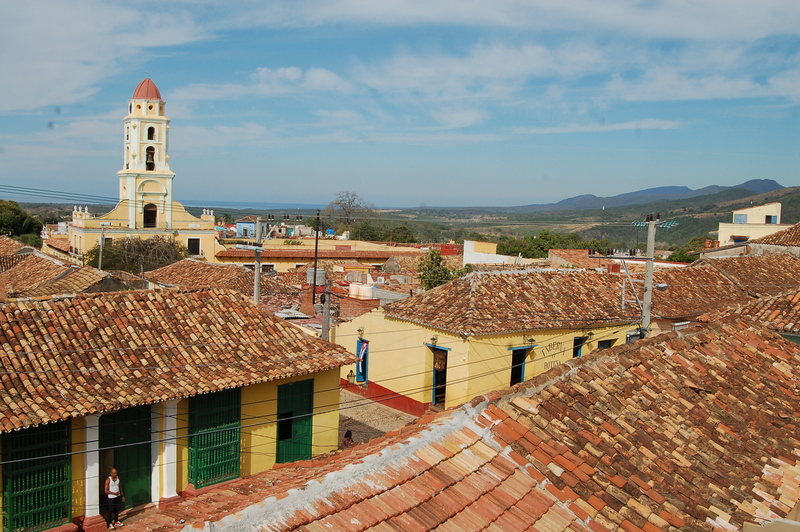 Most of the major towns have minicipal free wi-fi in the main squares. But there is hardly a spot dark enough to see my screen, and then you still need that prepaid card. Water pressure goes down to zero in the afternoon, if you wish to flush the toilet and take a shower you need to be an early riser. And don`t forget to bring your own TP. Meanwhile it is March 18 and I have not been able to post this. I managed to download my e-mails and send a few but unable to post any pictures to FB. Thursday the one place where I can buy a wi-fi card ran out and still had none yesterday. BusTrip to TRINIDAD. This was a delightful visit on Thursday. 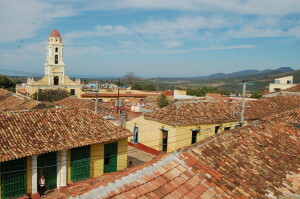 Trinidad is about 45 miles south east of Cienfuegos. My video camera was not cooperating but I think these still pictures tell the story. A delightful coastal town with all coble stone streets and red clay tiled roofs. Something straight from a movie set. Just like Dubrovnik you need to get your pictures before the tourist buses unload a steady stream. One of the old monestaries is now a museum exhibiting the glorious victory of Castro`s communism. The accomplishments of the 1959 revolution are everywhere. It is much more in your face than it is in Vietnam. I had my five minutes of glory just before leaving Trinidad. 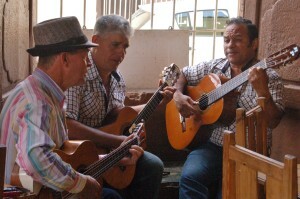 Three guitar playing singers, “Trio Ensueno”, were singing a harmony very similar to the well known Putumayo Social Club. They sang my favorite “La Malaguena”. Originated in the sixties from the “Los Paraguayos” and the Kingston trio made it a hit in the United States. I joined in and they were pleasantly surprised to hear a Gringo sing it. It is a very difficult song to sing with high notes that go on forever. 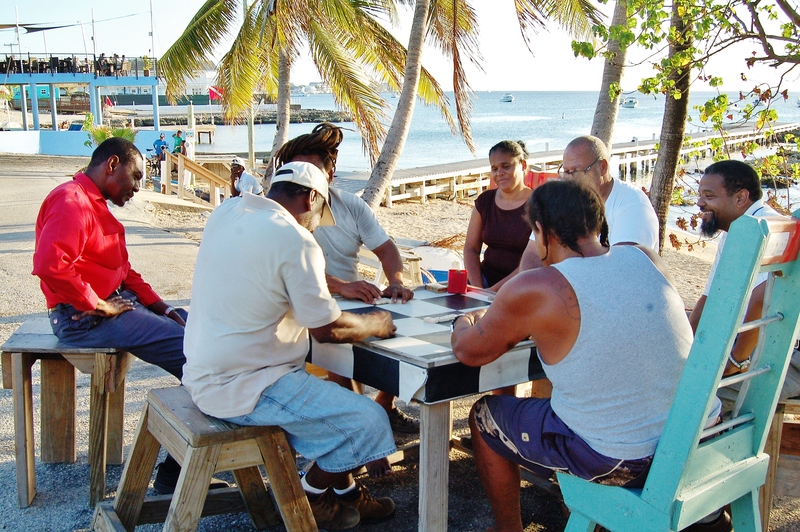 I am writing this on the way from Cienfuegos to Cayo Largo, an overnight sail. I shall arrive early Sunday morning. I had wanted to leave yesterday but was convinced that my anchor chain was crossed over my neighbor`s boat. They were supposed to leave Friday as well and I waited for them to pull their anchor first. But they still had not returned this morning. The wind had calmed and when I tried it once more this morning, it turned out that I was close but not across their chain, after all. 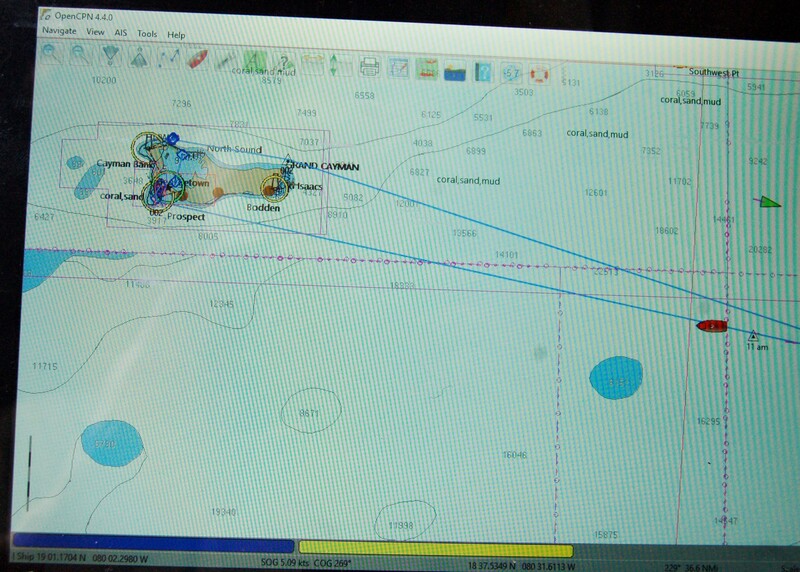 There is a strong, about 20/25 knot following wind and I am sailing just under the 90% jib, doing close to 5 knots. A welcome change from all the upwind sailing since the Costa Rica. It is women`s day and here are a few good men getting ready to walk in her shoes. I would do it but it is in the evening and I have no way to get back from shore in the dark. For the same reason I missed a presentation last Monday evening by Eva Schloss. Her mother married Otto Frank in 1953. Six years after the diary of Anne Frank was published. Eva and Anne were both born in 1929 and knew each other. Eva and her mother survived Auschwitz, the only survivors of her family. It is remotely possible that Eva would have run errands for her stepfather`s business to the bank where my father worked and how Otto knew my father. My dad received one of the first diaries from Otto Frank with his dedication. I learned of Schloss`s presentation from two med students I met here on the beach. Turns out that Liron Lashevsky is Israeli and his friend Jamil is Palestinian. I wanted so much a picture between the two, a picture of Shalom/Peace/Salem. You just have to take my word for it. This picture looks more like David and Goliath, no I have not shrunk. Liron has relatives in Amsterdam. My new laptop is in George Town. I need to claim it at Customs when I clear out. My German friends are planning to check out on either Friday or Saturday morning and I plan sail with them to Cienfuegos, Cuba. It has been blowing like stink, 20/25 knots due to a cold front on the US Atlantic Coast. But it is starting to calm down. This has been a welcome respite from paying marina moorage fees and the public mooring buoys provided a lot securer ground tackle than my anchors would have provided in this week`s blow. But prices for food etc. are very steep. It must be one of the few places where the local dollar is higher than the US $. About 22%. I was unable to get to shore on Sunday morning. I depend on the kind towing service of my two German neighbors. They tow my dinghy against the strong wind and I row back from shore. But I had ample inspiration from services broadcasted here on the FM stations. Sorry, no pictures this time. busy day in George Town Bay. Today has got to be the busiest cruise ship day in town. L.R. (as well as I could determine) : “Monarch”, Carnival “Fantasia”, “Liberty of the Seas”, Disney “Fantasy”, Holland America Line “New Amsterdam”. It is 3.46 am, sleepless from Seattle. Probably a left over from the night schedule on the sail here and the six day sail from the Panama Canal. I can see far enough on the AIS screen to set the alarm for one hour naps. And I catch up on my sleep during the day. My previous blog was just before departing Montego Bay. The custom and immigration officers came to the YC at 9 am on Monday. “Rebell” was anchored out and the other German boat, with Walter and Elke, “Sunrise” was med moored next to me on the dock. A squall was coming in on to my port side. We should have waited this out. Brendt and Birgit helped to take the long line off the mooring in their outboard powered inflatable dinghy. It became a very scary drill. “Sunrise” managed to get off their mooring buoy but I had to cut my engine when the long line my friends in the dinghy were taking up was going to get into my prop. This drove me onto the mooring line of “Just Dreamin” whose crew had flown to B.C. just before I arrived. I had met Justin and Loree in Balboa, Panama. The rain came down in buckets, I was totally soaked. In the end I managed to get off without a scratch to either boat. In the action we learned that we should have availed ourselves of the assistance from the dockmaster with their launch. Once away from land I had to put two reefs in the main with a North Easterly in a broad reach. Here I was giving away again all those hard upwind miles fought to get to Montego Bay. But with the new plan to come north to Florida I`ll still have a good approach from here in the Cayman Islands to Cienfuegos in Cuba. I had great speed, hitting an average close to six knots, with the occasional hits on the downhill side of the, now growing, waves of eight plus knots. In the evening I had to lower the main all together and still maintaining 5 1/2 average with just the #3 jib. Part of this is the constant trade wind surface current, now I was getting the benefit after fighting this on the way from Panama. I covered the about 220 miles in 45 hours. 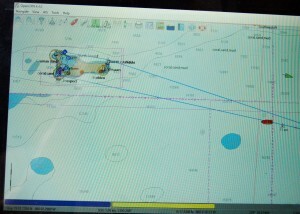 My route was set to the north end of Grand Cayman to go into the North Bay and moor in the marina at the barcadere. The North Bay was considered too shallow for the bigger German boats. I heard them a few times on the VHF radio and both called their birthday greetings in on the 28th. But I lost them from sight soon after leaving Montego Bay. But after I studied my electronic charts and the Google Earth pictures on my charts I decided that going into North Bay just was too risky. Elke came up with good way points for the North Bay from a local here and we are all planning to go in behind George Town at the barcadero, probably on Monday. We will stay on the free moorage buoys here on the leeward north side of George Town because there are some gale force winds predicted for Sunday. After a few days in North Bay we will all three head for Cienfuegos, Cuba. Was it coincidence? I passed the 80th west longitude at noon on the 28th. I celebrated it appropriately in my uppy, as SoloMan. With Birgit`s cake. I thank God for those 80 good years, that I can still enjoy life at its fullest and continue accumulating all these treasures in my family, friends and new experiences. God is good. The wind dropped when I came into shore of Grand Cayman and had to start up the iron horse. In order to announce my arrival to the port captain in George Town I shut the engine to better hear him. When I restarted the engine it would not switch to start. Frozen. I raised the #3 jib again and managed to sail onto one of the free orange buoys. An hour later the Germans buoy moored on each side of me. It turned out to be a Holiday and there was a $90 overtime charge. We all decided that we`d rather sit it out until Thursday, when it is free. I spent most of Wednesday, I had arrived at 8 am, to fix the starter problem, which wire goes to which pole? Crawled into the low and narrow space of the quarter berth. My injured back was killing me. Yesterday we were all led to the customs/immigration dock to clear in. When I started the engine to drive back the starter kept skipping gears. I killed the engine. Quickly, raised the #3 jib which was stowed away on the bow, still hanked on. I attached the sheets and sailed back to the mooring buoy. “Sunrise” and the harbor patrol boat stood by to assist but I managed it once again to pick up the heavy rope and thread my bow line through it. I will not be surprised that there will have been a Gig Harbor cruise boat tourist watching this from the five cruise ships. In 2010 Pete Lancaster of my St. Nicholas Gig Harbor parish took a picture from a Viking cruise ship of “Fleetwood” in the Main-Rhine Canal. On a good day 15,000 cruise boat passengers disembark on George Town. 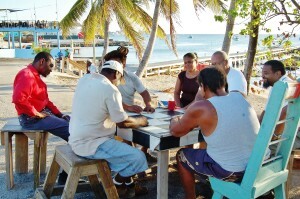 The entire population of the Cayman Islands is about 60,000. Quite a spectacle, yesterday at the customs/immigration dock. An army of reps from all the different tourist services with their placards, the passengers with their guides holding the number of his/her pack. Many of my best friends are golfers and cruise ship fans, when I grow up I might try it.